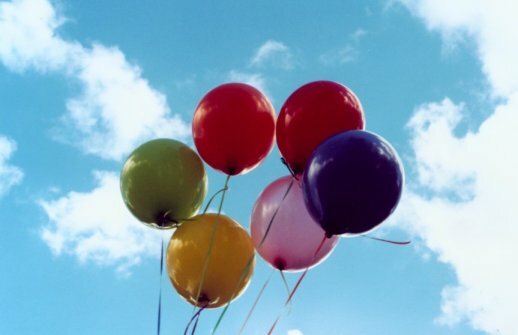 Photo of the Week..Helium balloons lift happy hearts into the blue sky. Astronomy news for the week starting Friday, March 22, 2002. The Moon grows through its waxing gibbous phase this week, and reaches full on Thursday the 28th about noon in the Americas. The night of Wednesday, the 27th, the Moon will be just short of full and will rise just before sunset, while the following night it will be just past full and will rise just after sunset. Only 10 hours before the full phase, the Moon also arrives at perigee, where it is closest to the Earth, about 5.5 percent closer than the average distance of 384,000 kilometers (239,000 miles). The result will be especially high tides at the coasts. The closer distance, however, is NOT responsible for the full Moon appearing to be so large at moonrise and moonset. The "large Moon" is an optical illusion whose origin has long been argued. The common explanation is that the eye references the rising Moon to things on the horizon, which makes it just look big, whereas when the Moon is high in the sky, the references go away and it looks smaller. For the same reason, constellations also look especially large when they rise and set. In truth the Moon is only a half a degree across, and surprisingly fits nicely well with the nest of the Pleiades star cluster, which is twice the lunar angular size. Four planets now dominate the nighttime sky. As twilight dims, look in the west for brilliant Venus. Above it lies bright reddish Mars now moving eastward against the stars of eastern Aries. While the red planet maintains its setting time shortly after 10 PM, the Sun is setting later and later, so is still catching up to Mars. By the end of May, the planet will be setting just as twilight ends. Higher still is Saturn, slowly drifting east among the confines of Taurus. The ringed planet is just making the transition to setting before midnight. After twilight ends, the most obvious thing in the sky other than the Moon is the last of the bright four, Jupiter, which shines brightly among the stars of Gemini, the giant planet setting about two hours after Saturn. All the bright planets, including even little Mercury, are slowly assembling for a nice gathering toward the beginning of May, though Jupiter will be left a bit on the sidelines. With the eye focussed on Saturn and Jupiter, one might forget to look farther north to admire one of the sky's great constellations, Auriga the Charioteer, which holds one of the great stellar luminaries, Capella. The constellation is made of a prominent pentagon that attaches directly to Taurus to the south. Both these constellations are in a faint part of the Milky Way impossible to see under moonlit conditions. Within that part of the Milky Way lie the dark dusty clouds of some of the nearest of all active star-forming regions.